Home›Blog›What are the anti-aging measures for Industrial PVC lay flat hose? What are the anti-aging measures for Industrial PVC lay flat hose? The use of Industrial PVC lay flat hoseis a certain period of life, we use time to take some measures to slow down the aging of water, improve the life of products, what specific effective measures? 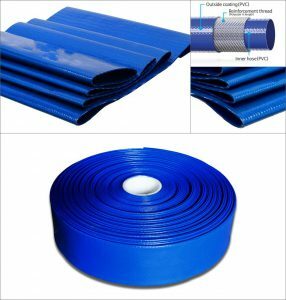 There are many types of water, plastic Industrial PVC lay flat hoseis the most well-known one, the outer layer is coated with a layer of PVC lay flat hoses, so the layer is relatively smooth, the use of resistance, installation and use of convenience. It not only adapts to the strong and smooth coating, but also makes it easier to wash. It plays an important role in modern industry and agriculture, and is more and more recognized by users.